On April 16, 2016, The Economist published two articles on China's efforts to use development assistance as a foreign policy tool. In "Diplomacy and aid in Africa", an interactive widget built by The Economist data team juxtaposes our dataset of Chinese official development assistance to 50+ African countries with how countries align their votes with China in the UN General Assembly. In "A despot's guide to foreign aid,"The Economist cites findings from the AidData Working Paper, "Apples and Dragon Fruits: The Determinants of Aid and Other Forms of State Financing from China to Africa. 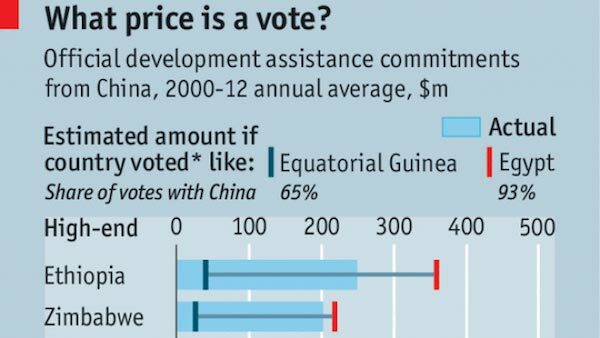 "The analysis in both articles shows that the more aid a country receives from China, the more likely its votes align with China. The 1.2 version of AidData's Chinese Official Finance to Africa Dataset tracks 2,647 development finance activities in Africa from 2000 to 2013. The data includes both Chinese aid and non-concessional official financing.